For Olympian Frank Shorter, Running Was An Escape From A Troubled Home : The Torch He won the Olympic marathon in Munich in 1972, a dramatic triumph that helped fuel the running boom in the United States. But as he writes in a memoir, running helped him deal with a dark secret. American Frank Shorter grabs a drink from a table while running through Munich in the 1972 Olympic marathon, which he won. 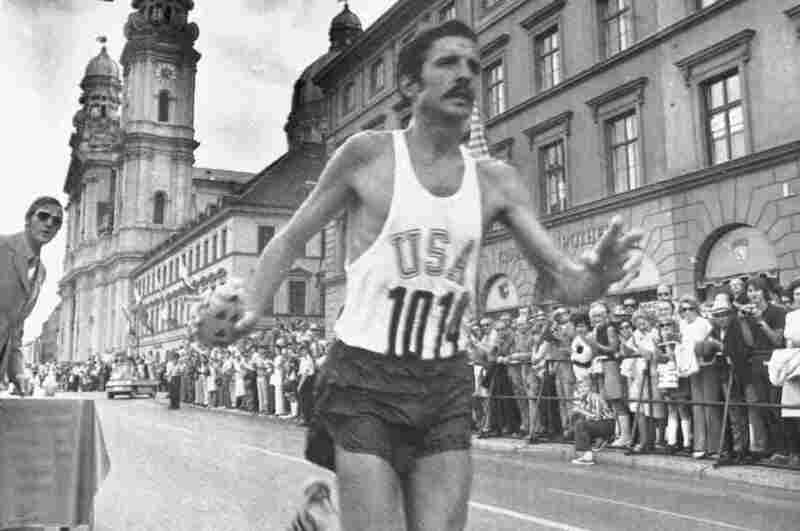 Frank Shorter won the Olympic marathon in Munich in 1972, and four years later added a silver medal in the same event in Montreal. He later helped establish the first anti-doping agency in the U.S. and served as a spokesman against athletes using performance enhancing drugs. But his public persona hid a dark secret: the years of abuse he and his siblings suffered at the hands of their father, Dr. Samuel Shorter. 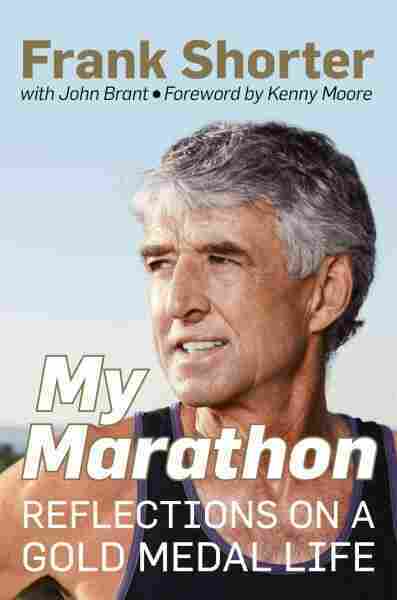 Shorter discusses his life and his memoir, "My Marathon," with Here & Now's Eric Westervelt. He was a totally different person when he came home. His main purpose at home was to discipline his children. And then also to stifle any creativity or goals or anything else about them. My conclusion really is he's one of those few human beings who didn't want his children to exceed him. I realized at 5 (years old) when he was beating me up one day. He would come home and interrogate my mother late at night. And then his modus operandi was then decide which child he was going to discipline, and we would wait for him, and we'd hear him come up the stairs, and we'd just have to see into whose room he would go and who he would drag out of bed and beat. And I found, that at about age 8, I began to spend a lot of time out of the house, and I started to run. And then I realized this was really stress relief for me, because, when I was out there, out of the house, running, he couldn't get me. He couldn't catch me. That really is how I got into the running: to minimize stress and cope, rather than to have goals of going to the Olympics. "It was something he didn't do, he wasn't an athletic person. I think it was part of my first way to not be like my father. Now as an adult to look back, I realize, I think had this instinct of not passing this along, and I tell all young kids, when they start in sports, I say, 'Try all sports,' because there is a biomechanical movement that every person loves and enjoys the most, and mine happened to be running. I found I just loved moving across the ground. I could think about whatever I wanted, and I was safe." I was sleeping on the balcony. It was like 4 in the morning. I said, 'I've been out here several days. It's the first time I've heard this. This is not a door slamming. This is a gun.' And as we went through the day, we just stood out there on the balcony and looked across, and at one point — if people can remember there's a famous photograph of one of the terrorists in a balaclava with a submachine gun on the balcony — well, we saw that person, and that shows you how naive we were. It had never happened before, and all he had to do was just sort of spray bullets at us if he wanted to, because we were that close. But we were, in a sense, all in shock. I think the modern term is "compartmentalize." I think I learned at a very young age when I went outside the door of my house, which was a prison, I could just turn off thoughts and focus on things over which I had control. So that's what I would do — in effect, blot it out. And then think about it when it was appropriate because the only thing over which I had control was fear, and fear of what the terrorists might do, and I was not going to let them win on that. They opened up and the story just became more horrific. There were rapes. It was horrific abuse. It was better for them, I think. When my brother died last year, which was maybe the impetus to write the whole story and how it fit in the context of my life, how I think about things, how I do things, where it came from. They really were much, much... not happier, but they were more relieved, I think, to finally have it out there, because part of this process is, number one, you really, really have the kind of fear of this kind of person that you can't describe and it lasts your whole life. You fear this person in a way that is indescribable. The other part of it being, their being able to talk about it, it actually is true. And I think part of that is, you wonder since it was so horrific, 'Am I making this up? Have I imagined it as worse than it was?' And we all found out, no, we found out it was worse than we thought it was. It really was good for them, because now there's no sort of undercurrent anymore when we get together. I think that's the best way to describe it. 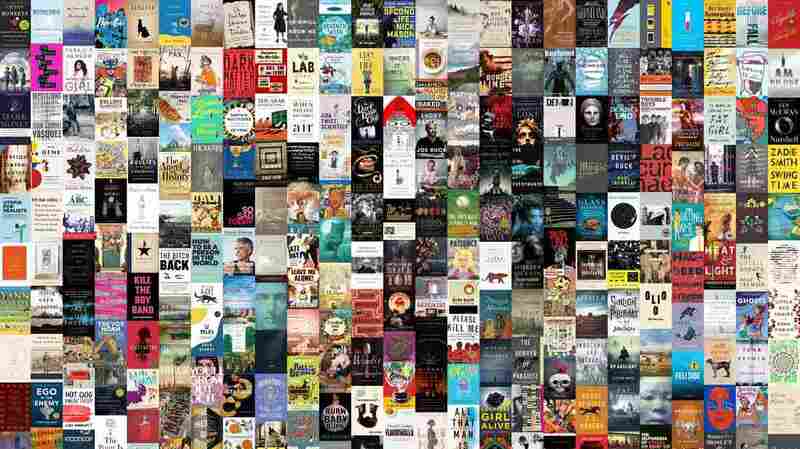 The Book Concierge is back and bigger than ever! Explore more than 300 standout titles picked by NPR staff and critics.